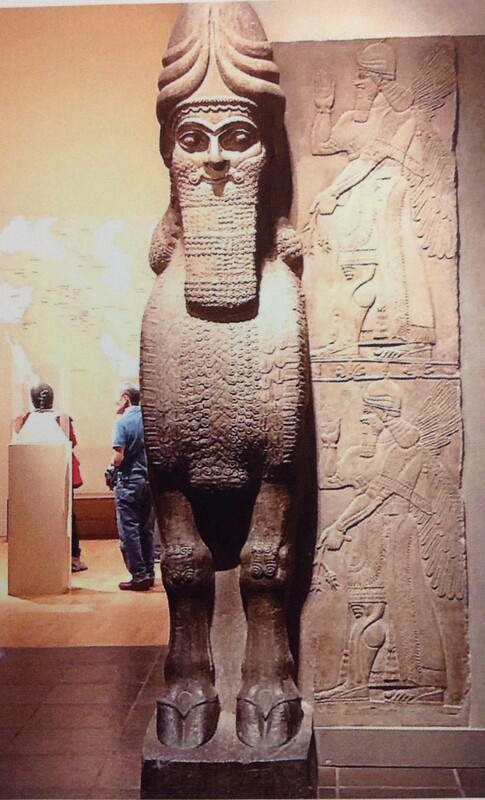 The subject of Lamassu is a statue depicting a hybrid creature with a man’s head, a lion or ox body and bird wings. There is intricate line work in the beard and fur, as well as lots of linear lines in the feathers. The artwork is made up of two statues that mirror each other on either side of the archway. Looking at the statute from the front it looks like as if it is standing still, from the side however the statue displays movement through the use of adding another leg. The brow casts a shadow over the eyes, while the chest is protruding out from the body, casting a shadow over the legs and underbelly. There is no colour on the work, however there are theories that pigment was used. Our attention is drawn to the texture of the beard and fur because it is much more intricate than the rest of the work. Although it is a hybrid, it is fluid and harmonious. From the side it appears asymmetrical, but looking at it from the front it is symmetrical. There is repetition in that the work is mirrored on the other side of the archway. The use of stone is imperative on a work this scale, because using another medium such as clay would likely crack. The effects achieved are able to be replicated in other mediums such as other stones or metals. Because it is in stone, the work comes across as cold and emotionless, invoking a sense of power. The statues have a sacred feeling, because people in that period trusted that Lamassu could fight demons and protect them. Looking at them from the front it seems as if they are watching you, but from the side they show a more natural and welcoming image. To people entering the city this would make it seem as though Lamassu is protecting the city from outsiders, and to people within the city leaving the statues appear more friendly. The artwork is 3.13m tall and is held in the Metropolitan Museum of Art, New York City. It was excavated during the 1840’s in Nimrud by Sir Austen Henry Layard, and was eventually acquired by J.D. Rockefeller who donated it to the museum. It was made in Nimrud (ancient Kalhu) between 883 BC and 859 BC. It protected and supported the entrances to city gates and citadels, which housed the temple and royal palace. It is made from a single piece of alabaster (gypsum), which was transported using logs similar to how the Egyptians built the pyramids.